919-742-2030 Call a top pro drywall finisher for level 5 drywall finishing in Pittsboro, Siler City Or Chatham County, NC. 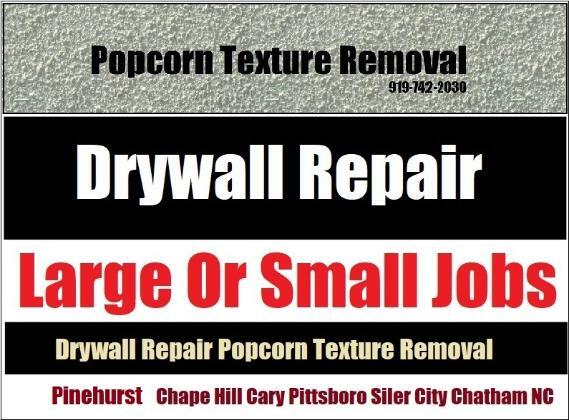 Professional repair, finishing and popcorn texture removal. Free estimates on large or small jobs. Contractor: nail pop, small holes, poorly finished joints, loose cracking joint tape and metal corner bead, holes, stress and settlement cracks, wet and water stained or damaged walls or ceilings can look like new. Pittsboro Drywall: Copyright 2017 All Rights Reserved 919-742-2030 - Top Pro Level 5 Drywall Finisher: Repair, Texture Removal, Finishing In Pittsboro, Siler City, Chatham County, NC. 27252, 27256, 27559, 27312, 27207, 27213, 27344. Pittsboro, Siler City, Bear Creek, Moncure, Chatham County, NC.